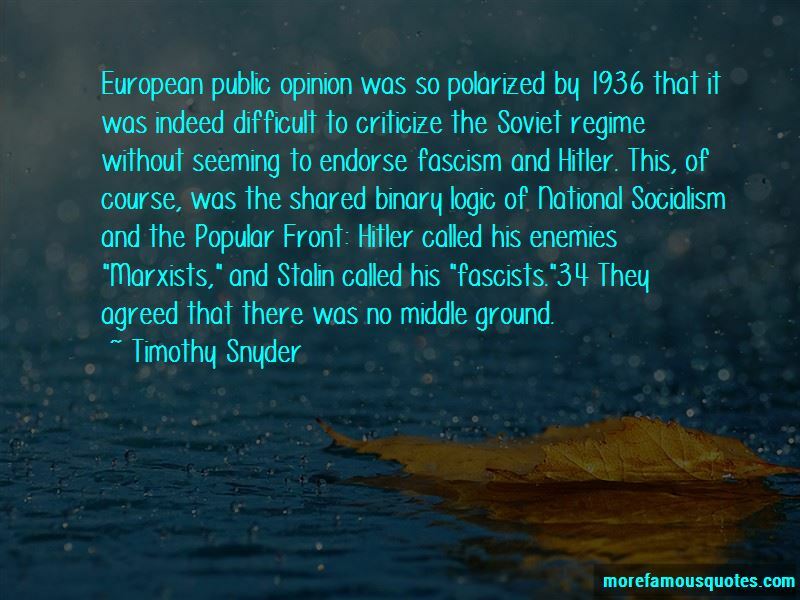 Enjoy the top 47 famous quotes, sayings and quotations by Timothy Snyder. Between July 1942 and June 1943, only 4,705 Jews were admitted to the United States-fewer than the number of Warsaw Jews who were killed on a given day at Treblinka in summer 1942. The lesson that Hitler had drawn from the Balkans, Schmitt presented as a purely German idea: There is no such thing as domestic politics as such, since everything begins with the confrontation with a chosen foreign enemy. The definition of the domestic was that which had to be manipulated to destroy what is foreign. Germany itself had no content. The idea of the people, the Volk, was there to persuade Germans to throw themselves into their murderous destiny as a race. The people were only what they proved themselves to be, which without struggle was nothing. “Stalin had developed an interesting new theory: that resistance to socialism increases as its successes mount, because its foes resist with greater desperation as they contemplate their final defeat. Thus any problem in the Soviet Union could be defined as an example of enemy action, and enemy action could be defined as evidence of progress. “The organization of the camps in the east revealed a contempt for life, the life of Slavs and Asians and Jews anyway, that made such mass starvation thinkable. In German prisoner-of-war camps for Red Army soldiers, the death rate over the course of the war was 57.5 percent. In the first eight months after Operation Barbarossa, it must have been far higher. In German prisoner-of-war camps for soldiers of the western Allies, the death rate was less than five percent. As many Soviet prisoners of war died on a single given day in autumn 1941 as did British and American prisoners of war over the course of the entire Second World War. In Ukraine's cities-Kharkiv, Kiev, Stalino, Dnipropetrovsk-hundreds of thousands of people waited each day for a simple loaf of bread. 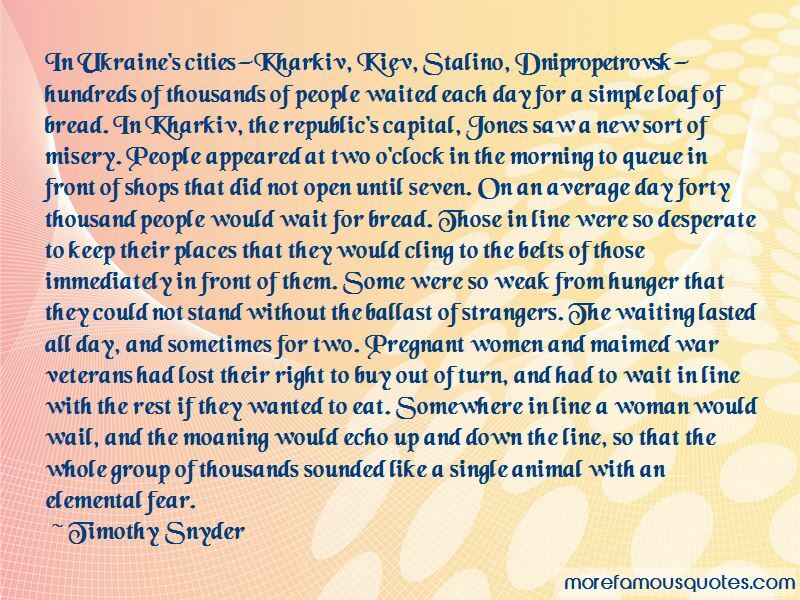 In Kharkiv, the republic's capital, Jones saw a new sort of misery. People appeared at two o'clock in the morning to queue in front of shops that did not open until seven. On an average day forty thousand people would wait for bread. Those in line were so desperate to keep their places that they would cling to the belts of those immediately in front of them. Some were so weak from hunger that they could not stand without the ballast of strangers. The waiting lasted all day, and sometimes for two. Pregnant women and maimed war veterans had lost their right to buy out of turn, and had to wait in line with the rest if they wanted to eat. Somewhere in line a woman would wail, and the moaning would echo up and down the line, so that the whole group of thousands sounded like a single animal with an elemental fear. Stalin's position in east Asia was now rather good. If the Japanese meant to fight the United States for control of the Pacific, it was all but inconceivable that they would confront the Soviets in Siberia. Stalin no longer had to fear a two-front war. What was more, the Japanese attack was bound to bring the United States into the war-as an ally of the Soviet Union. By early 1942 the Americans had already engaged the Japanese in the Pacific. Soon American supply ships would reach Soviet Pacific ports, unhindered by Japanese submarines-since the Japanese were neutral in the Soviet-German war. A Red Army taking American supplies from the east was an entirely different foe than a Red Army concerned about a Japanese attack from the east. Stalin just had to exploit American aid, and encourage the Americans to open a second front in Europe. Then the Germans would be encircled, and the Soviet victory certain. Dead human beings provided retrospective arguments for the rectitude of policy. Hitler and Stalin thus shared a certain politics of tyranny: they brought about catastrophes, blamed the enemy of their choice, and then used the death of millions to make the case that their policies were necessary or desirable. Each of them had a transformative utopia, a group to be blamed when its realization proved impossible, and then a policy of mass murder that could be proclaimed as a kind of ersatz victory. All in all, the purification of the armed forces, state institutions, and the communist party led to about fifty thousand executions. 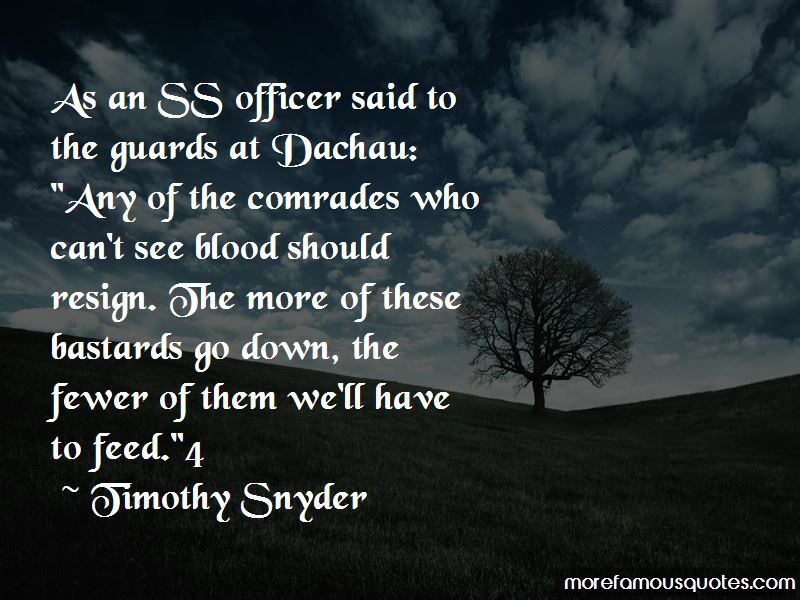 Want to see more pictures of Timothy Snyder quotes? 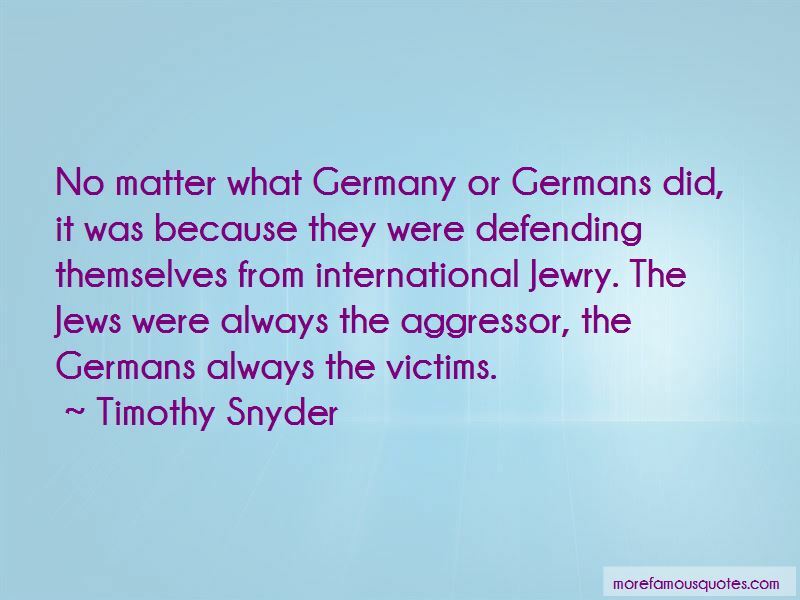 Click on image of Timothy Snyder quotes to view full size.